Midfielder Pelly-Ruddock Mpanzu has been backed to become a club legend for the Hatters by defender James Justin. The 25-year-old, who signed for Luton under former boss John Still back in December 2013, reached his double century of appearances during the 2-1 win at Bristol Rovers on Saturday. He is the only member of the current team to remain with the Hatters since their Conference days, as Justin said: "Everyone knows Pelly is the funnest guy at the club, all the time smiling. "He’s going to be a club legend soon, getting promoted from the Conference, League Two and then hopefully League One this season." Manager Mick Harford, who played Mpanzu at the base of the diamond once more with Alan McCormack not in the squad, added: "Pelly’s gone into that holding role where we try and rotate round. "I thought his energy, his enthusiasm, and also he looked like he had a bit of know-how playing in that role. 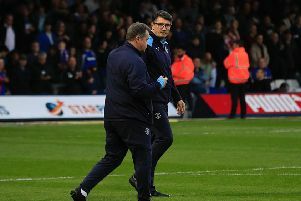 "It was difficult as we tried to get a screen in front of (Jonson) Clarke-Harris and we asked the midfield players to narrow off a little bit for second balls. "He did a great job Pelly, I’m really pleased for him and just want to congratulate him on his 200th appearance."